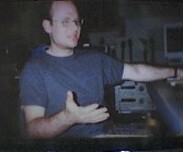 Michael Shelley: photos page two! Making the "I Blame You" album at Tarquin Studios. 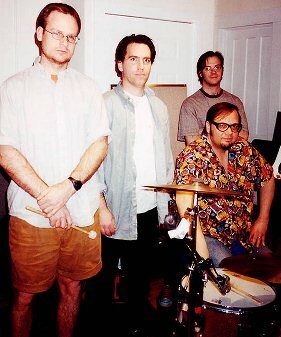 Peter Katis, Michael Shelley, Dennis Diken, John Lee. 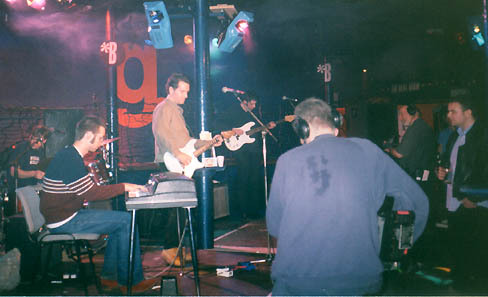 Here's a few more photos takes at Tarquin Studios, during the making of "I Blame You"
Taping "The Beatroom" TV show in Glasgow. (l-r) Francis McDonald(drums), Chris Geddes (keyboard), Michael Shelley (guitar), Stevie Jackson (bass) and unidentified sweaty cameraman. 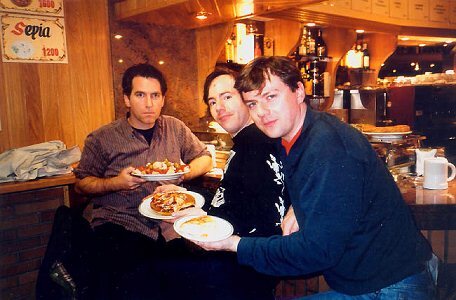 Cheeky Monkey takes a break on the Spring 2000 tour of Spain. 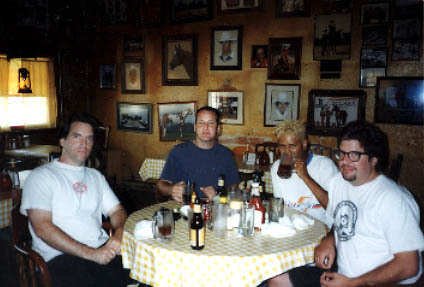 (L-R) Michael Shelley (with mixed tapas), Mark Scrufari (with Pulpo), Francis Madonald (with Torta Espanol). 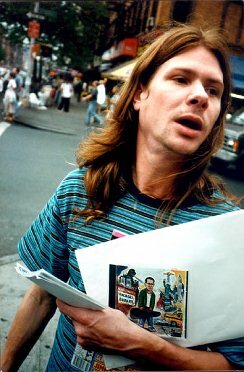 Kenneth Keith Kallenbach enjoys a copy of Half Empty. Konichiwa! Michael and the boys yuck it up backstage in Cleveland with headlining Japanese pop legends Shonen Knife. 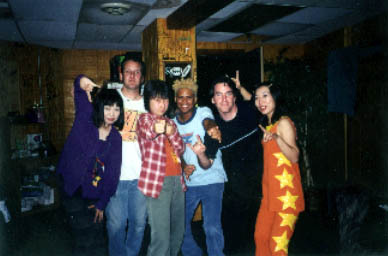 Left to right: Michie Nakatani, Dave Green (drums), Naoko Yamano, Mike Randle (bass), Michael, Atsuko Yamano. Atsuko watches knowingly as Michie hustles Mike Randle out of his meal money in Detroit Rock City. 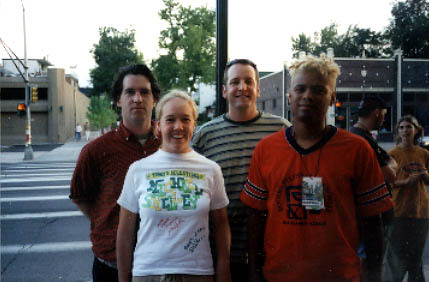 Outside the Bluebird Theater in Denver Co. with Jordan, the superfan, who made her own T-shirt! Eating meat & deep fried corn at Clark's in Tioga, Texas. 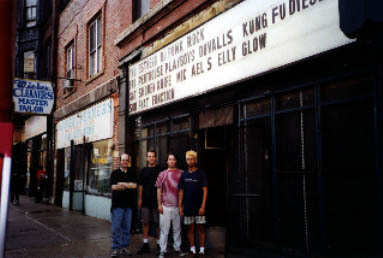 That's fearless road manager Scott Taylor on the right. 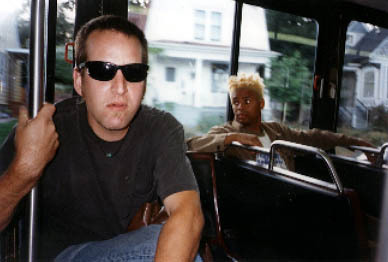 Artsy fartsy shot, taken on a day off, of Dave and Mike on the public bus in Portland Oregon on the way to see Cheap Trick at an outdoor show (which was only $2.00!, and was great).